In South America you will find this tropical tree growing. It is deciduous and the flowers appear before the leaves. The flowers colored golden yellow sometimes cover the entire tree with vivid results. 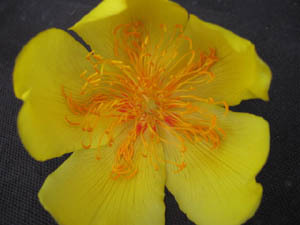 You won't need to wait long to see flowers, plants as young as 2 year old should bloom. The leaves, star-like shaped, grow in the spring and are also attractive. It is drought tolerant when established. This magnificent flowering tree will only perform well in warm locations. 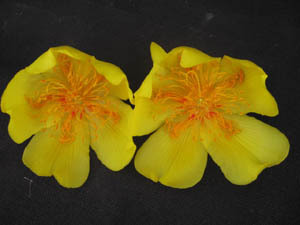 Even though it can survive temperatures in the low 30°s, a hard freeze may knock down the flower buds before they open. The tree can grow up to 40' in height but will look much better if kept around 12'-15. Trimming should be done only after the tree has finished blooming.